I was recently able to attend the Council for Exceptional Children’s National Conference in Indiana. I love being able to hear about current research, connect with educators, and learn new strategies and techniques. This year I was thrilled to see a session titled “Instructional Decision Making: Students Who Use AAC: What Do the Experts Say?” Perfect! I thought. I’ll learn what the research says and come away with some specific, concrete ideas to apply to my work with Joey. Interestingly enough, this is the opposite of what happened. The research team presenting shared that their original plan was to research how to support para-professionals when they are interacting with children using AAC devices. Quickly into their work they realized they couldn’t come to consensus among themselves of what to teach the para-professionals. If a group of university professors could not identify best practice for AAC devices, who could? 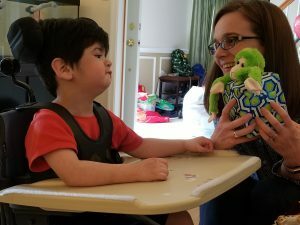 Their research changed at this point to look more at current decision making practices in the field, and how teams are teaching and supporting students in their use of AAC. There are currently few guidelines available to support the decision making process of selecting when and if to introduce a device, and how to teach or support the student’s communication. Practitioners are in conflict over which communication skills to target first, and even what assessment information to use when considering how and when to use a device. This surprised many of us in the audience, except the findings rang true with our experiences. We could each relate to the debate of discussing with teams which device to use, whether we should use behavioral approaches to introduce new vocabulary and to teach the use of the device, or to approach the instruction from a developmental method. If you gather a team together to discuss using an AAC device, you are likely to hear the same discussions. 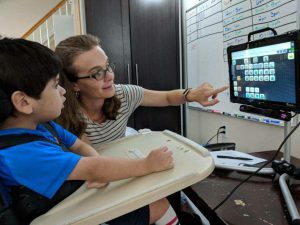 While it would be nice to have more concrete research into the hows and whys of using an AAC device, this was a good reminder in the importance of collaboration. In order to make the best decisions for a child we need to gather a team together, truly look at the child’s abilities and needs, and consider multiple possibilities. 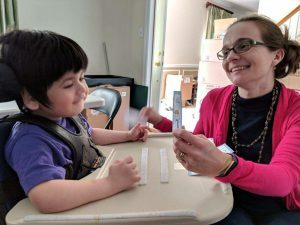 Without a set guideline we can do our best work by frequently communicating with parents and other practitioners, and constantly reflecting on the student’s growth. 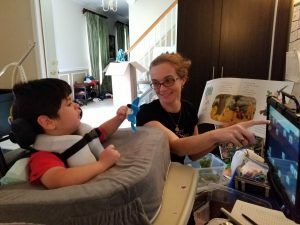 For me, it was a good reminder to keep an open mind with all aspects of the AAC device. There isn’t one right answer out there, so let’s keep our work Joey-focused and always be asking if what we are doing is working for Joey in the moment and if it will support his future communication growth. In trying to find a book that Joey may find engaging, I grabbed It’s Not Easy Being a Bunny by Marilyn Sadler. This is one of those books I’d never classify as quality children’s literature, but it has all the right elements to be an engaging read aloud for the four through six year old crowd. It is four and five year old sense of humor funny. A bunny trying to be a possum? Too silly. But the humor does not involve needing to make inferences or understand that characters have two different ideas. To make this as engaging as possible for Joey while he does not have his device, I gathered toy animals to represent each animal in the book (except the possum. I don’t have a stuffed to possum. I don’t think TY ever made one in Beanie Baby form, but I could be wrong.) Lately Joey’s taken to sifting through my bin of animals in order to select each one as we come to that page in the book. He likes to be presented with multiple choices of animals, and then dig through to find the correct animal. This is a change in our practice, from when I’ve just handed him the animal, or when he chose between two animals I held up. As his motor skills are increasing I suspect he likes the challenge and the independence, as well as the opportunity to think through which animal he needs. In addition to using the physical toy representations of the animals, I also laminated clip art pictures of the animals and put velcro on the back so that Joey could take the pictures on and off his tray. This also makes it easy for us to line up the animals, count them, and use the pictures to tell number stories. Just like with the toys, Joey now likes to be presented with all of the choices. He scans his options, finds the correct animal, grins, and works on coordinating his motor skills to reach the correct picture and pull it off the page. As I began to read the book to Joey and introduce the opportunities for interaction with him, Joey’s smile grew. He loves having opportunities to participate, and truthfully, seems to believe the more opportunities, the better. 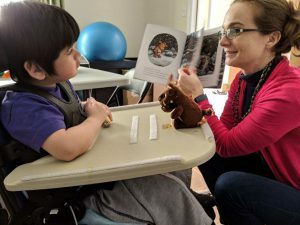 After Joey became more familiar with the book, I realized I could transition from “what animal is this” to “what animal will be next?” Joey’s grin grew even bigger when I asked this question, and he was fast to show off his memory of the order the animals were presented. There are nine animals in this book, so I was fairly impressed that he was able to put the animals in order with 100% accuracy. I’m not sure I could do that, and I’ve probably read the book over 100 times in the course of my own childhood and using it as a teacher. Now, while we wait for Joey’s device to be fixed, I’m off to find another equally engaging read aloud for Joey. We can’t have him bored and quiet when we know what he is capable of! What Makes a Good Book for Joey? I’m not sure what I’ll do if I have to read Room on the Broom one more time with Joey (OK, truthfully we all know that I’ll read it and be as excited about reading it as I was the first time…) but I honestly am not sure I can. I’ve stretched the book as far as I can. We’ve counted characters forwards and backwards, identified rhyming words, acted it out, spent time on the prepositions of the book, talked about weather, emotions, and even friendship. Yet still, Joey latches onto it. Joey critically eyes the box each time I see him, and waits for the right moment to request it in whatever manner is available to him. Without his device he is quick to point, make eye contact, give some verbal utterances, and point again, silently willing me to open up the box and pull out his favorite characters. As I try to find another book he’ll love just as much I find myself wondering what exactly is so appealing about this book. He seems to want it even more now that he does not have his device. What makes Room on the Broom just so engaging and enjoyable for Joey that he requests to read it so often, even when we have so many other books around (so. many. others)? There is comfort in the predictability of the book, which is especially comforting when Joey cannot share his thoughts and ideas. When we first started reading it he was excited to label the pictures and share what he observed in the pages. Now that he does not have his device, he is quick to request the toy that corresponds with each character, in the order the characters appear. He knows the comfortable routine of the story, and loves waving a magic wand during the repeated phrases. Without his device, this book gives him opportunities to interact. The book seems to have the right mix of repetition and novel storyline to give Joey the opportunities to engage while also being entertaining. While Joey’s old favorite series, Pete the Cat, has a great repeated storyline, I’ve noticed he’s not as excited by these books lately. Although he can participate in the repeated phrases, these books don’t offer the same exciting story engagement that Room on the Broom does. Today we are going to attempt to read The Gruffalo’s Child in hopes of matching Room on the Broom’s repetition and enjoyability. Fingers crossed that it is a fit. “What comes next?” I asked Joey, holding up the 5 and a 14 number cards. We’d just put down four and were building a long number line. Joey looked me in the eyes, then promptly looked at the number 14. And then burst into a fit of giggles. Right. The kid knew exactly what he was doing. Joey looked solum as he I handed him the five and together we added it to the number line we were building. He remained calm as we counted the numbers we already had, touching each one to make sure we had one to one correspondence. “Now, what comes next? 6 or 11?” I asked. Once again Joey burst into laughter. A body-shaking fit of giggles. Apparently 1, 2, 3, 4, 5, 11 was too silly a concept for him. Math jokes. Joey clearly didn’t understand or care that I was seeing if he could identify the correct numeral in a sequence from a field of two choices. He thought it was hysterical to count incorrectly, or to just give me the wrong answer. Whatever was happening in his mind was funny, and his giggles were contagious. I tried to keep myself together but it was hard. Every time we got serious he’d look at the incorrect answer and giggle again. Head back, whole body shaking giggles. As though our math work was a comedy routine. By the time we got to the higher numbers 11 through 15 – Joey was a bit more unsure, and wouldn’t laugh until I’d told him the right answer. Then he’d look at the wrong one. So even though he completely refused to complete my work correctly, I came away with knowing that he can order his numbers 1-10, so now I can target my instruction on the teen numbers (between giggles of course). Joey can be serious and has been known to say “work” on his device when I arrive because he’s ready to get to it. Sometimes when I try to get us into silly back and forth pretend play experiences he drops the toy, not interested in my games. “Read,” he’ll say in response to my silliness. But math jokes? Yeah – he’s got ‘em. I love his uncontrollable laughter and his sense of humor, and that once again he found a way of taking my plans and turning them into his own, while still showing me he could complete the task. The Joseph Robert Shaw Foundation. Inc. doing business as "Joey's Foundation" is a 501(c)(3) nonprofit organization.